Button & Wilde is a fabulous, wonderfully scented bath and body range that you can customise and personalise to create the perfect gift for a loved one. Button and Wilde have a wonderful collection of hand washes, bath bubbles, body scrubs, body lotions, bath milks, hair and body washes and face lotions. Anyone who loves to pamper themselves would love to receive one (or more!) of their fabulous products. There are 6 fragrances available; Wild Citrus Rose, Tarocco Orange & Nutmeg, Wild Fig & Grape, Lavender, Geranium & Chamomile, Sweet Beet Lime & Cedarwood and Infused Citrus Spice, so you can choose the perfect fragrance for your mum. Luxury bath and body products that you can personalise. One feature that makes Button and Wilde extra special is that once you have chosen your product, you can then design the front label. You can upload a photo, a pattern or use one of Button and Wilde’s templates and then add a personal message. This creates a wonderfully personalised gift that no one else will have. I have tried the Wild Citrus Rose bath bubbles and I found this fragrance very relaxing. This fragrance is a fusion of sweet rose with a spicy citrus twist and is gorgeous. The fragrance of the bath bubbles helps you relax whilst the rich, creamy lather gently cleanses and conditions your skin. These bath bubbles are the perfect way to pamper yourself and my skin felt wonderfully soft when I stepped out of the bath. The RRP is £12.00 for 250ml. I have also tried the Wild Citrus Rose Body Lotion which brilliantly moisturises and hydrates your skin as it includes a combination of grape seed oil and shea that is quickly absorbed and leaves your skin feeling soft and velvety. My skin not only felt very soft but also smelt wonderful as this scent entwines floral fragrance with a classy woody finish. 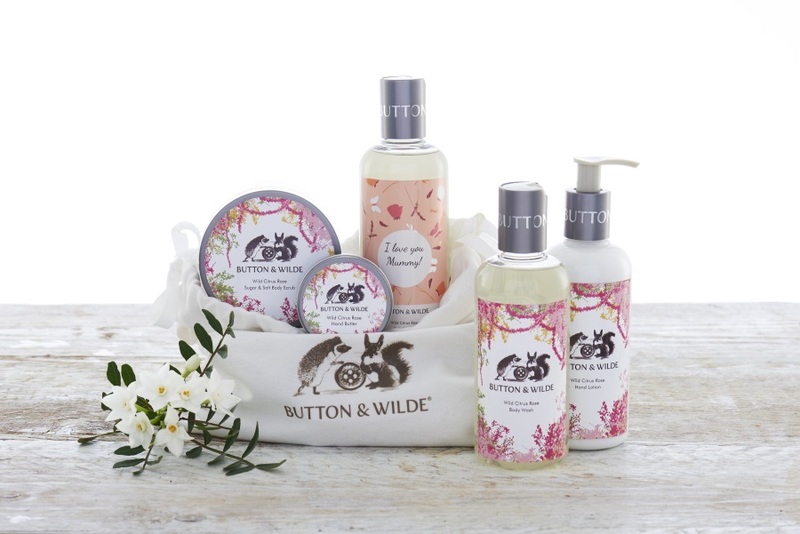 Button and Wilde have a fabulous range of pampering gifts that can be personalised to create a bespoke gift. Each individual order from Button and Wilde is made by hand and beautifully gift wrapped in tissue and a cotton gift bag.